During a “PEI human rights” mediation, #UPEI ( “University of PEI”) and “PEI Human Rights commission” will refuse to comply with the “contract to mediate” that all 3 parties signed to mediate. Victims will be legally attacked with bogus laws, when they do not have legal representation, threatened, blackmailed, and brutally harassed , with threats of further illegal and criminal acts, sufferings, and losses. “UPEI lawyer”, “PEI Law society” member, “Murray Murphy” claimed that female students “DESERVE to be assaulted, abused, threatened…..DESTROYED”. “UPEI lawyer”, “Murray Murphy” stated, in this “PEI human rights” mediation, that he “and “UPEI” DESTROYS all female victims in order to permanently silence them.” Permanent silencing is done with the unethical and illegal acts of destroying the victims’ personal and professional reputations. This guarantees #UPEI a permanent silencing on their massive corruption and targeting, luring and abuse of female students scam, to prevent the victim, from having any credibility, if she were to expose the massive corruption, fraud, abuses of female students, and horrific corrupted and unethical practices, behind this tainted and fallen “Ivory Tower” of #UPEI. As soon as the victim signs a mediated contract, with the “University of PEI” ; #UPEI will claim it does not comply with such contracts and/or laws. #UPEI then increases the abuses and violations against the victim. Regardless, the corrupted collusion, allows #UPEI to violate all the rights of the victim. 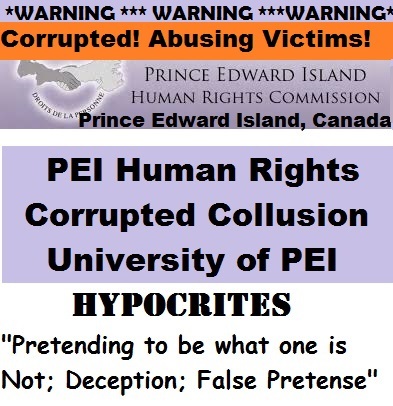 The “PEI Human rights commission” is corrupted and #UPEI officials, “UPEI Registrar” and “UPEI Vice-President Academic” have claimed that the illegal acts and #Harassment, #discrimination, and illegal acts will continue as they have been given ‘immunity’/’protection’ from “Prince Edward Island Premier Robert Ghiz”. 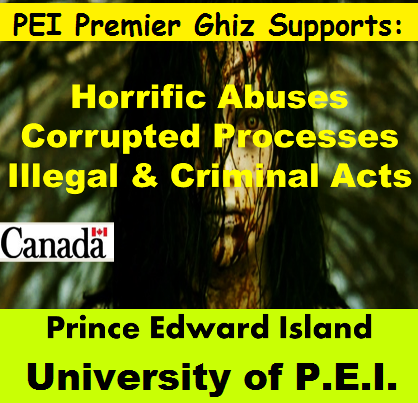 “University of Prince Edward Island” administration, representing “UPEI” and “UPEI President” claimed that these illegal acts are being directed by their lawyer, with the approval, support and promotion from “PEI Premier Robert Ghiz’. #UPEI officials refused to stop, as they claim that “Prince Edward Island Premier Ghiz” had given them , what they referred to as , ‘immunity/protection’ to do all illegal and criminal acts. #UPEI officials claim, as well, that the abuses, criminal and illegal acts, corrupted processes, were approved, protected and promoted by “PEI Premier Robert Ghiz”. 3. “Greg Howard” former Head of “PEI Human rights commission” oversaw the corrupted mediation and post mediation processes. When the victim submitted evidence, to the Judicial investigation on corrupted “human rights” processes, showing Howard’s involvement, Howard resigned within hours and left the country within weeks. 4. “Lorraine Buell”, a secretary in the “PEI human rights commission” who was a first time mediator. She acted as a legal mediator with a licence and quoted bogus laws and refused to stop. She was asked to step down, as mediator, several times, by both the victim and her support person, a professor, due to biases, incompetence and acting as a lawyer without a licence; but Buell refused. Calls for her to step down , to Howard, fell on deaf ears. “PEI Premier Robert Ghiz” and “Minister Janice Sherry” (who oversees the “PEI Human rights commission” and also connected to various “status of women” boards and “PEI Advisory Council on the status of women” boards) illegally halted a “PEI Justice Department” investigation when a lawyer/investigator identified CRIMINAL acts in the victim’s complaints. A criminal act of “FORGERY” was identified and 2 lawyers were connected to the forgeries. one lawyer was “Murray Murphy” the 2nd lawyer has remained unnamed. #Ghiz and #Sherry gave #Murphy a ‘QC Title’ when they were made aware of the criminal acts. #Murphy has remained silent regarding the 2nd “PEI lawyer” involved in forging the documents, with him. The victim claims this 2nd lawyer is related to “Prince Edward Island Premier Robert Ghiz”. #Ghiz and #Sherry also gave this ‘QC title’ to #Murphy while #Sherry publically claimed that #Murphy, #UPEI, and “PEI human rights commission” complaints were still under ACTIVE investigation. Since this announcement, #Sherry, #Ghiz, “Department of Justice”, “PEI Government” have refused to respond to requests for updates on the victim’s formal complaint/investigation. There is a Corrupt Mediation and Post Mediation processes where #UPEI will REFUSE to comply, with any contract they sign, so they can increase the abuses and harassment of females. Increase abuses, losses, and illegal and even criminal acts on the victim. There is bad faith mediation, abusive mediation and #UPEI does NOT comply to signed mediated contracts with their victims, which allows for increased #harassment, #abuses, #bullying, illegal and criminal acts, on the victim, post mediation. As was threatened, on one victim, before placing her complaints with the corrupt “PEI Human Rights” , there is a corrupted “collusion” between #UPEI and “PEI Human Rights Commission” that would cause a traumatized abused female victim even further abuses, trauma, suffering and losses. This was followed through on by “PEI human rights commission”, “UPEI” and “PEI Government” officials. The corrupted and abusive mediation was followed through, exactly as had been described, in the threats, to the victim, dated and recorded- July 2011. • the victim was exposed to unfair legal attacks, by #UPEI lawyer, “Murray Murphy” when the victim did not have a lawyer; and was legally attacked by #UPEI nursing professor, “Rosemary Herbert” and “PEI Human rights” secretary/mediator, “Lorraine Buell” with bogus laws and cases. • “Murray Murphy” threatened the victim, stating #UPEI and he would “destroy her”, like all other victims of “UPEI corruption”, #Murphy promised he and UPEI would “destroy her academic and personal reputations”…that is, what was left of them, just like have and will continue to do to anyone who exposes UPEI for “corruption”, “fraud”, further “abuses”. Threats also included illegal and criminal acts against the victim. • As was threatened, the victim would have even more financial losses when she had to hire lawyers to stop the abuses and unfair legal attacks, where #UPEI and #Buell had to be told to stop stating bogus laws and for the laypersons: “Lorraine Buell” and “Rosemary Herbert” to stop practicing law, under the direction of “Murray Murphy”. As soon as #UPEI signed the contract, they refused to comply. #UPEI officials claim that “Murray Murphy” directed them NOT to comply and to break laws. *produce and circulate, circulate through mail, fraud transcripts, etc. *Complaints regarding the “retaliation”, refusing to comply with a mediated contract, banning, increase harassment are derailed by the “PEI Human Rights commission” as per their corrupted collusion. “PEI human rights commission” will even breach the “human rights” mediated contract. The corrupt commission will do illegal acts such as slander and libel, breaches and so on. Total corruption, abuses and illegal acts. *All formal complaints submitted to #PEI government will be blocked, when evidence to support the complaints, are submitted. #PEI and #UPEI corruption includes horrific abuses of #UPEI female students, involving illegal and criminal acts, threats, fraud, and corrupted cover-ups. Both #UPEI and #PEI officials brag of a corrupted “PEI human rights commission”, corrupted judicial system, and will threaten those, who have exposed the #corruption #harassment #discrimination and #abuses of #students, at #UPEI, with “destruction”. This “destruction” has been threatened on 1 victim several times, including threats made to her during a corrupted “PEI Human rights commission” mediation process. The “destruction” includes a permanent silencing of victims, whereby #UPEI and #PEI destroys their personal and academic reputations. A well practiced unethical silencing tactic used by #PEI and #UPEI. When abused female “students” sign “human rights” mediated contracts with #UPEI , after a bad faith, corrupted “human rights” mediation process; #UPEI officials will claim that they do NOT comply with any “human rights” mediated contracts and/or laws. #UPEI officials claim their lawyer, “Murray Murphy” is directing the illegal and criminal acts. #UPEI officials also claim that #Murphy’s illegal acts, abuses and other illegal and criminal acts have been approved and are supported, promoted by “PEI Premier Robert Ghiz”. #UPEI officials claim that such illegal and criminal acts will continue, as they claim, what they refer to as, “immunity/protection” from “Premier Robert Ghiz” to participate in such illegal acts. When a Judicial Investigation, showed criminal acts in complaints against “PEI Human rights commission” and “UPEI”; “PEI Premier Ghiz” and Justice Minister, “Janice Sherry” awarded 1 of the involved lawyers, “Murray Murphy”, who was still under active investigation, according to public statements made by “Minister Janice Sherry” with a QC title. “Murray Murphy”, “UPEI lawyer”, and an unnamed “PEI lawyer” were involved with forging documents, corrupted mediation and post mediation “human rights” processes. Murphy has remained silent, on the 2nd lawyer, who was involved in forging apology letters, from a victim to her abusers. However, a victim, who made formal complaints, to the “PEI Justice Department”, claims the 2nd lawyer is related to “PEI Premier Robert Ghiz”. #UPEI has banned public access to these female victims. As such, #UPEI does not qualify, for the millions , it receives, each year, from “Canadian taxpayers” . “Taxpayers” monies, via #Ghiz and federal transfer taxes, to the province, from the federal government. Banning females, due to non-compliance of contracts, is NOT a valid reason to ban public access to a publically funded institution. In fact, it is an illegal reason. #UPEI officials claim “Prince Edward Island Premier Robert Ghiz” supports the banning of female victims , who signed mediated contracts with #UPEI. Thus, the illegal banning access to a public funded institution will stay in effect. This banning is to further #discriminate against females and to HUMILATE them, while continuing to destroy their academic and professional reputations. A constant and ongoing threat that has been followed through on since 2010. #PEI is corrupted to the core. There needs to be an outside inquiry into all the corruption, illegal acts as all processes on #PEI are corrupted. Thus far, #UPEI has refused to co-operate with outside agencies. There needs to be a RCMP investigation due to the alleged criminal acts, by those in high positions, both at the “University of PEI” and the “Prince Edward Island Government”. A female victim was threatened, with the specifics, of a corrupted “PEI Human rights commission” collusion with the “University of Prince Edward Island”. The corrupted “collusion” would cause increased abuses, violations, “harassment” and losses to a female victim. The collusion meant corrupted mediation AND post mediation processes. #UPEI claimed the “PEI Human Rights commission” was run by #UPEI and victims would endure corrupted processes. #UPEI also threatened that such corruption was promoted by “PEI Premier Robert Ghiz”. #UPEI maintained that #UPEI did NOT comply with human rights laws and this unwritten policy was promoted by “PEI Premier Robert Ghiz”. All threats were followed through on. There was a corrupted mediation where the victim endured further violations and abuses during this corrupted process. 3. “PEI human rights” secretary, acting mediator, for the first time, “Lorraine Buell”. Buell was asked several times, by both the victim and her support person, a professor, to step down due to her incompetence, blatant biases, and acting as a lawyer without a licence and quoting bogus cases and laws. Buell refused. Complaints were submitted to Howard but he refused as well. As was threatened, as soon as the victim signed a “PEI human rights commission” mediated contract with #UPEI, “University of PEI” refused to comply. #UPEI then increased the #harassment, #discrimination, #violations, #slander, illegal and criminal acts on the victim. “UPEI” officials have claimed their illegal and criminal acts were directed by “Murray Murphy” and had been approved, supported and promoted by “Prince Edward Island Premier Robert Ghiz”. “PEI Premier Robert Ghiz has interfered with and blocked a formal investigation of these complaints, with the “PEI Justice Department”. The illegal acts, including criminal acts continue on this victim. A formal complaint was submitted and accepted by the PEI Justice “Minister Janice Sherry”, regarding the #corruption , #fraud , increased “human rights violations”, #discrimination , #harassment and abuses that a female victim endured. Such as, bad faith mediation, corrupted collusion, threats, and corrupted post mediation, including the forged and #fraud documents. A lawyer/investigator in the “PEI Justice Department” identified criminal acts in the victim’s complaint. These criminal acts were also cc to “PEI Premier Ghiz”. “PEI Justice Minister Sherry” and Education Minister, “Alan MacIsaac” and the 2 law firms where each lawyer worked. Again, the victim requested a halt to the forged documents that UPEI refused to stop circulating. These were forged documents that were deemed a ‘criminal act’ by the “PEI Justice Department” lawyer/investigator. In response to this information, “PEI Premier Robert Ghiz” and “Minister Janice Sherry” honor “Murray Murphy” with a QC title. Sherry was confronted ,by the victim publically. Sherry , stated publically, that the investigation against “UPEI”, “PEI Human Rights Commission”, “Murray Murphy” and another #PEI lawyer was still under active investigation. Since this time (Nov 2013), Sherry, Ghiz, all government offices and politicians ,involved , have refused to respond to the victim, and her multitude of requests for updates, on this formal investigation. 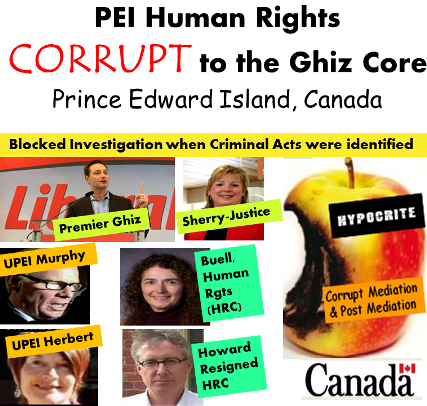 “PEI Premier Ghiz” and “Minister Janice Sherry” have refused to respond to questions surrounding their awarding Murphy a QC title ,while Sherry proclaimed, publically, that Murphy, #UPEI , and “PEI Human rights commission” formal corruption complaints were still under ‘active investigation’. An active investigation that described the forgeries, written by Murphy and an unnamed lawyer (related to #Ghiz ), as being a criminal act. The victim claims the identity of the 2nd lawyer, involved in the forgeries, is RELATED to “PEI Premier Ghiz” . Murphy has remained silent regarding the identity of the second lawyer involved with the forged documents. The forged documents were caught by a National agency when Murphy and former “UPEI Dean of Education” submitted them to cover up years of lies and scams to get professors, who were named on human rights complaints, teaching awards. The former Dean of Education was demoted when the National agency made complaints to #UPEI. The Dean resigned and was hired at the former community college where Ghiz had attended. The “UPEI Registrar” and “VP Academics UPEI” have refused to stop sending forged, and other fraud documents (through the mail) claiming they were being directed to do such illegal acts by “Murray Murphy”. #UPEI officials have refused to stop the brutal increased abuses, criminal and illegal acts against females, who signed mediated contracts, with the “University of Prince Edward Island”. #UPEI claimed they have, what they referred to as, ‘immunity’/’protection’ to do illegal, including criminal acts, from “PEI Premier Robert Ghiz”. As such, #UPEI have refused to stop the illegal and criminal acts. Not only are the “PEI Human rights commission” corrupted hypocrites but other officials, who have jobs that represent the rights of women on “PEI”. For example, the “PEI Advisory Council on the status of women” have remained silent and have refused to respond to the victims pleas for help. Horrid abuses and violations inflicted upon a victim. When the “University of Prince Edward Island”, “PEI Premier Robert Ghiz”, and/or “PEI Government” officials are questioned about the complaints of further abuses, illegal acts, against female victims, and/or breaches, they have, an agreed upon statement, which they will state in response. They state: they have “settled with the victim” and ‘even signed a contract with her”. They make slanderous statements about the victim and her complaints of corruption, breaches, illegal and criminal acts against her. They also downplay all questions with further slandering of the victim. Slanderous statements with lies on why they believe the victim is making complaints of corruption and further illegal, criminal acts against her. “UPEI” and “PEI”‘s agreed upon statement/response is NOT a complete statement and thus, deceitful and a lie. “UPEI” does sign a mediated contract, but, as was threatened on 1 victim, “UPEI” has no intentions of complying with the contract and will INCREASE the abuses and illegal acts on the victims. They fail to mention that they breach and refuse to comply with contracts they sign, a planned breach before going into bad faith “PEI Human rights commission” mediation. They also fail to mention that they have increased the illegal, criminal acts and brutal abuses, “harassment” and “discrimination” on the victims. Instead, of complying with the contract, they have refused and maintain an increase in illegal acts against the victim, including fraud and forgeries, criminal harassment, slander, libel, discrimination, banning access to public education, and so on. “Murray Murphy”, “PEI Law society” member claims “ALL female victims are DESTOYED” by “UPEI” and himself! As “Murray Murphy” threatened, as well, on 1 female victim, during a corrupted and abusive mediation, he and “UPEI” will destroy all female victims. A “destruction” of female victims that is promoted by the “PEI Premier Robert Ghiz” while abusers and those who participate in the abuses/criminal acts will be rewarded. “Destroying” female victim’s academic and personal reputations, while increasing the “harassment”, “discrimination”, criminal and illegal acts against the victim. “Murray Murphy” and “PEI Human rights commission” brutally abused, threatened, and bullied a victim during a corrupted “PEI Human rights” mediation where both “UPEI” and the “human rights” mediator claimed that their illegal acts and brutal abuses and destruction of all female victims was promoted by “PEI Premier Robert Ghiz”. The victim was threatened that female victims are “DESTROYED” while the abusers and those who participate in the abuses, illegal and criminal acts against the victims are rewarded. This threat continues to be followed through by PEI Premier, Officials and UPEI. There is corrupted and bad faith mediation and corrupted post mediation processes, where all rules, policies, and laws are NOT followed. Females are denied #rights and access to fair processes. The “UPEI” mediators for one corrupted “human rights” mediation were: 1. “UPEI lawyer”, “Murray Murphy”, ( a “PEI law society” member) AND 2. “UPEI Nursing” faculty, “Rosemary Herbert” (Herbert was promoted to Dean of Nursing following her role in this corrupted mediation. Herbert continued to refuse to comply with laws and contract to increase the abuses and illegal acts, on the female victim, post mediation). There was a 1st time “human rights” mediator, Buell, who was blatantly biased and refused to follow any of the rules in the contract to mediate. Buell was asked to step down, due to her incompetence and biases, by both the victim and the victim’s support person, several times. The victim’s support person, a professor, even told Buell to stop practicing law and explained the differences between biased and non-biased, while giving examples of how Buell was biased. Buell refused to stop regardless of both the victim and her support person (a professor) asking and telling Buell that she was breaching the mediation contract, was NOT a lawyer, and examples of her blatant biases. Buell refused to step down. Requests to have Buell removed, with evidence showing unfair and corrupt legal attacks , using bogus laws, on the victim, who did not have a lawyer and brutal abuses and mediation contract breaches, were made to “Greg Howard” who oversaw this corrupted mediation. Howard refused to remove Buell. “Lorraine Buell” is a “human rights” secretary who acted as a lawyer, “Lorraine Buell”. The victim had to hire lawyers to stop the abusive legal attacks that were being used in this corrupted mediation. One lawyer told, both Herbert and Buell, to STOP practicing law. The victim’s lawyer also told, both Herbert and Buell , to STOP making up laws and incorrectly interpreting the law. “Greg Howard” who oversaw the corrupted processes,(mediation and post mediation complaints) resigned, within hours, when the victim submitted evidence, showing his involvement, in the corrupted mediation and post mediation “human rights” processes. Regardless of the multitude of requests and even demands, from the victim’s lawyer, for Buell to STOP practicing law; Buell always REFUSED. 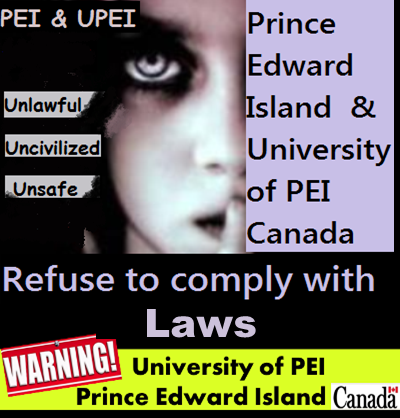 UPEI officials Maintain: UPEI Does NOT Comply with the “Human Rights” Mediated Contracts they Sign with Victims and Does NOT comply with Laws; and Does NOT Comply and/or Abide to ANY HUMAN RIGHTS LAWS! After an abusive and corrupted “PEI human rights mediation”, “UPEI” will sign a mediated contract with the victim. As soon as “UPEI” signs the contract, they will refuse to comply and will breach the contract while they INCREASE the abuses, criminal and illegal acts, against the victim. “UPEI Registrar” and “UPEI Vice-President Academic” (“Kathleen Kielly” and “Christian Lacroix”) claim they are being directed, by “PEI law society” member, “Murray Murphy” to breach contracts, illegally; ban the victim access to public education, produce fraud and forged documents, increase the harassment, slander and abuses on the victim. Illegal and unethical acts. These illegal and unethical acts from UPEI Administration. “UPEI officials” claim they will continue to do, known illegal and criminal acts, against the victim, as they have been given ‘immunity’/’protection’ from “PEI Premier Ghiz” who promotes and supports their illegal actions and abuses on female victims. 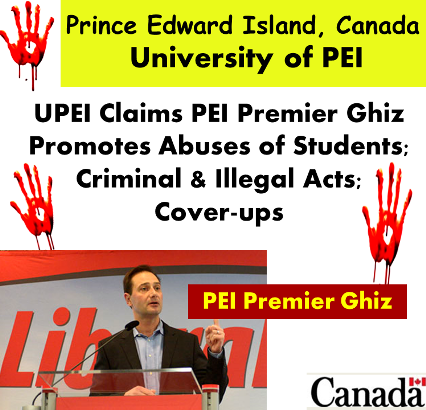 UPEI claims that “PEI Premier Ghiz” promotes all illegal acts, further abuses, against the female victims who were abused at “UPEI”. UPEI claims they are being directed to do such illegal acts by “Murray Murphy” with “PEI Premier Robert Ghiz”‘s approval, protection and promotion. “UPEI Registrar”, “Kathleen Kielly”; “UPEI Vice-President Academic”, “Christian Lacroix”; “UPEI Dean of Nursing”, “Rosemary Herbert” and “PEI law society” member, “Murray Murphy” REFUSE to comply with the “PEI Human rights commission” mediated contract they signed with a female victim. “UPEI” officials claim that they do NOT comply with “PEI Human rights” mediated contracts they sign with victims and/or laws. “UPEI” has increased the “harassment”, “discrimination”, “human rights” violations, threats, illegal and criminal acts on a female victim. “UPEI” officials claim they are being directed to break laws and do illegal acts by their “UPEI Lawyer”, “Murray Murphy”. “University of Prince Edward Island” officials claim they are being directed to break laws as this is being promoted and ‘protected’ by the “PEI Premier Robert Ghiz”. 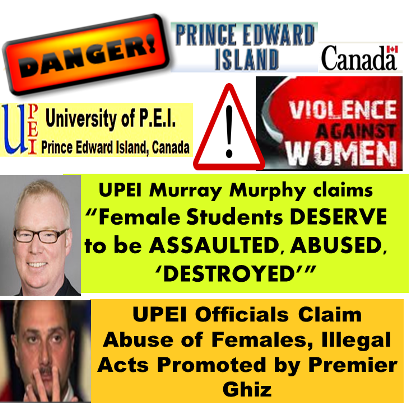 “University of PEI” officials have REFUSED to stop the illegal and criminal actions against a female victim as they claim they are following #Ghiz and #Murphy’s directions. “UPEI” continues to ban a female victim, claiming they do not comply with contracts and/or laws. This is an illegal reason to ban a female access to public education. As such, “UPEI” and “PEI Government”, including “PEI Premier Ghiz” knowingly gave “UPEI” public funds, aka “Canadian taxpayers” monies, when both “UPEI” and “PEI Government” were aware that they were banning a female public access, thus disqualifying #UPEI from being funded with taxpayers’ monies. “UPEI”‘s increased in abuses against the female victim include such illegal and criminal acts as fraud, forgeries, criminal harassment, mailing known fraudulent documents, as well as, slander, libel, discrimination, harassment, cover-ups of obstruction of a police investigation (criminal act) and on and on. “UPEI” was caught submitting forged and fraud documents to a National agency to cover-up lies and scams they had pulled for the past several years. UPEI documents are NOT CREDIBLE. The “UPEI dean of education” was demoted and resigned. The disgraced dean was replaced by an Education professor who was also involved in fraud and forgeries, obstruction of a police investigation, bullying female victims off campus, harassment, slander and so on. The former “UPEI Dean of Education” who was caught submitting the forged and fraud documents went to work at the community college where “PEI Premier Robert Ghiz” had attended. Both “UPEI”, “PEI” and “PEI Premier Robert Ghiz” have refused to stop the illegal and criminal acts against this female victim. “University of Prince Edward Island” does not settle “human rights” complaints with female victims. After a violating, abusive and bad faith mediation, “UPEI” will breach the contract and refuse to comply. “UPEI” will INCREASE the abuses, criminal and illegal acts on the female victim. “UPEI” will ban the victim, produce forged and fraud documents, increase the abuses, slander, libel, “harassment” and “discrimination” on the victim. As “Murray Murphy” threatened, on 1 female victim, during a corrupted and abusive mediation, he and “UPEI” will destroy all female victims. Destroying their academic and personal reputations while increasing the harassment, discrimination and criminal, illegal acts against the victim. “Murray Murphy” and “PEI Human rights commission” claim they have the approval and this is promoted by “PEI Premier Robert Ghiz”. There is corrupted and bad faith mediation and corrupted post mediation processes, where all rules, policies, and laws are NOT followed. Females are denied #rights and access to fair processes. The “UPEI” mediators for one corrupted “human rights” mediation were “UPEI lawyer”, “Murray Murphy”, ( a “PEI law society” member) “UPEI Nursing” faculty, “Rosemary Herbert”; a biased and “human rights” secretary acting as an “unauthorized lawyer”, “Lorraine Buell”, and a corrupted former head of the “PEI Human rights commission”, “Greg Howard” who oversaw this corrupted mediation and post mediation. Howard resigned when the victim submitted evidence showing his involvement in the corrupted mediation and post mediation. After months of violating, illegal acts with further bullying, threats, “human rights” violations on a female victim, in a corrupt “PEI Human rights commission” mediation process, #UPEI signed a mediated contract with the victim. But, as was threatened a year before, for 1 victim, #UPEI will not comply with any contracts they sign and will INCREASE the “harassment”, “discrimination”, and abuses. The lies, bullying and brutality towards the victim is inhumane. There are criminal and illegal acts on behalf of “UPEI”, “PEI Human rights commission” and “PEI Premier Ghiz” and “Minister Janice Sherry”, “Minister Doug Currie” and present “PEI Education” Minister, “Minister Alan MacIsaac”. UPEI will increase the #abuses #violations #harassment #slander #bullying and illegal acts ,such as banning the victim access to public funded education (UPEI), refuse to stop circulating fraud and forged documents (criminal acts) , increase the “harassment”, slander, and brutal bullying of the victim. A lawyer/investigator in the Justice Department identified criminal acts in the victim’s complaint. These criminal acts were also cc to “PEI Premier Ghiz”. “PEI Justice Minister Sherry” and Education Minister, “Alan MacIsaac” and the 2 law firms where each lawyer worked. Again, the victim requested a halt to the forged documents that UPEI refused to stop circulating. These were forged documents that were deemed a ‘criminal act’ by the “PEI Justice Department” lawyer/investigator. In response to this information, “PEI Premier Robert Ghiz” and “Minister Janice Sherry” honor “Murray Murphy” with a QC title. Sherry was confronted ,by the victim, in public. Sherry stated publically, that the investigation against UPEI, PEI Human Rights Commission, Murray Murphy and another #PEI lawyer was still under active investigation. “PEI Premier Ghiz” and “Minister Janice Sherry” have refused to respond to questions surrounding their awarding Murphy a QC title ,while Sherry proclaimed, publically, that Murphy, #UPEI , and “PEI Human rights commission” formal corruption complaints were still under active investigation. An active investigation that described the forgeries, written by Murphy and an unnamed lawyer (related to #Ghiz ), as being a criminal act. #UPEI officials have refused to stop the brutal increased abuses, criminal and illegal acts against females who signed mediated contracts with the “University of Prince Edward Island”. 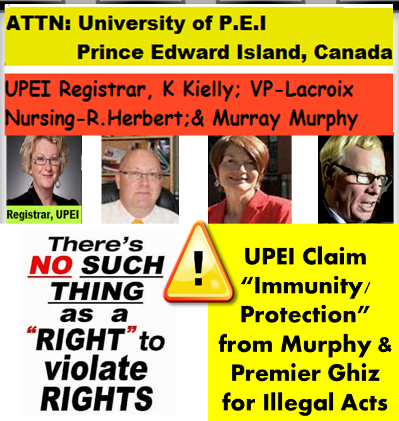 #UPEI claimed they have, what they referred to as, ‘immunity’/’protection’ to do illegal, including criminal acts, from “Murray Murphy” and “PEI Premier Robert Ghiz”. As such, #UPEI have refused to stop the illegal and criminal acts. As per the documented threats made on a female victim, dated July 2011, the #UPEI officials maintain that “PEI Premier Robert Ghiz” and “Murray Murphy” are directing the illegal and criminal acts against the female students while providing those involved with such criminal and illegal acts ‘immunity/protection’. “PEI Human Rights Commission” actively and remain active in their promoting brutal and inhumane abuses on female students at “UPEI”. In addition, these corrupt hypocrites have also promoted the “discrimination” and “harassment” of female victims. In a mediation, “PEI human rights commission” and “UPEI” REFUSED to comply with the “UPEI” Insurance carrier’s requirement of teaching against sexual harassment, stating that it would “Embarrass those involved” with the assaults, sexual harassment, slander, bullying of female victims. The “PEI Human rights commission” official reports OMITS the complaints against “UPEI”.